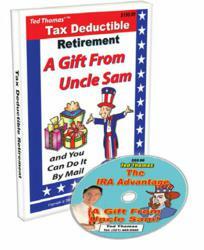 Tax deed sales investing book for retirees has been written and published by Ted Thomas. This book is now available at http://www.tedthomas.com/products and provides an in-depth resource for those that want to become educated about how to get into tax deed investing with retirement earnings. This new tax deed sales book for retirees is now available and is one of the only resources available online dedicated to this part of real estate. Ted Thomas has written and published a new book series that provides a comprehensive resource for those that want to learn the strategies centered around retirement investing. This new tax deed sales book for retirees is now available and is one of the only resources available online dedicated to this part of real estate. Those that want to become educated about this topic can learn more at http://www.tedthomas.com/step2 online. The real estate market is one area that some people have used to grow personal retirement funds. While some get started with rental properties or selling homes, there are alternative forms of investing that are used by some successful real estate moguls. These methods are now part of the information that is included in the brand new published book. Over 30 books have been authored and published by Ted Thomas. A tax deed sale is conducted in almost every county in the United States. Those interested in real estate often attend these sales with the hope of purchasing a property for a discounted price. Retirees that are searching for investment opportunities could find that buying this mortgage-free real estate can produce returns higher than traditional investing opportunities. The new book written and published by Ted offers more than one way that someone can use retirement funds to make smart investments. This educational book is now part of a growing library of books, DVDs and other sources available. The new web store accessible from TedThomas.com now includes all of the titles that are currently offered. Apart from the book series launched online, a new webinar is available that is updated routinely with new information not published inside of the book series. This new webinar series is a recent addition to the website and is offered as an alternative to those that are researching tax deed information. These webinars are accessible for no cost online. Ted Thomas has taught alternative real estate investing strategies to men and women for more than 25 years. Through sold out in-person events, Ted has taught thousands of people the concepts of tax deed sales and tax deed certificates. More than 30 books have been authored by Ted on these subjects to help educate the public about the opportunities that are available for investment. Ted Thomas is an in-demand public speaker at top business conferences. The official TedThomas.com website was launched in 2004 and is now celebrating almost a decade of providing one of the largest informational resources related to mortgage-free real estate. Jones and Trevor Marketing Inc.